This is Part 3 of my How I Organized My Entire House for $0.00 (Really!) series. Part 1 (Intro) is here. 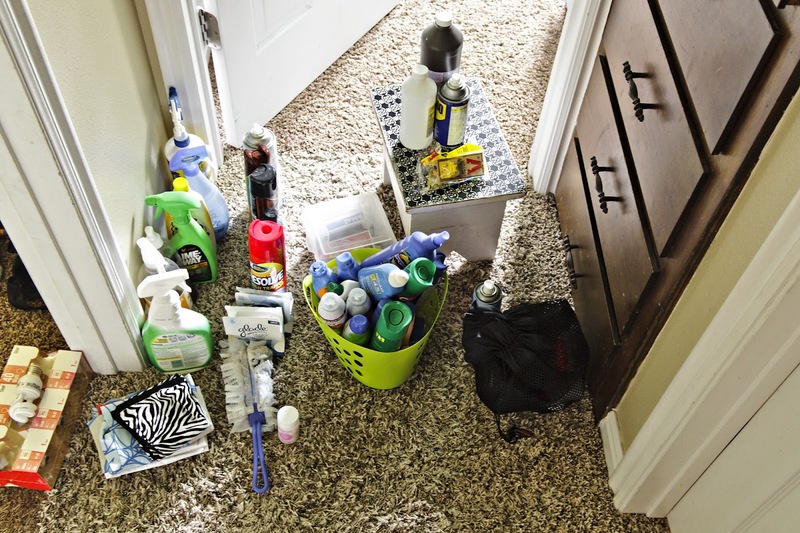 Part 2 (Simple Rules to Create Organization that Sustains Itself Plus Master Bath Organization) is here. It occurred to me that this should be my next project when I was sick on last Monday. Super sick. I slept almost the entire day on Sunday (I was awake for like five hours the entire day) and on Monday it felt like my bones are trying to escape from my body. Fun times. Except, I couldn't find the thermometer. Are you surprised, looking at this photo? Yeah, I wasn't either. The shelf on the top is our medicines and the bottom has some cleaning supplies and the sunscreen/hand sanitizer/light bulb type stuff. 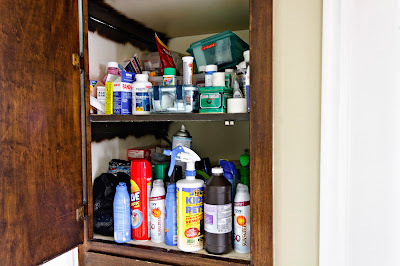 The medicine is actually kind of organized, but it ended up tossed all in there, and some of it was out because that is is the stuff we use the most. Somehow, I didn't take in progress photos of the medicine. More on that in a sec. But, you can see I got some white plastic bins (one was already in there, one I snagged out of the craft room). I corralled the sunscreen, bug spray and some hand sanitizer in it. Before, they had been floating randomly. 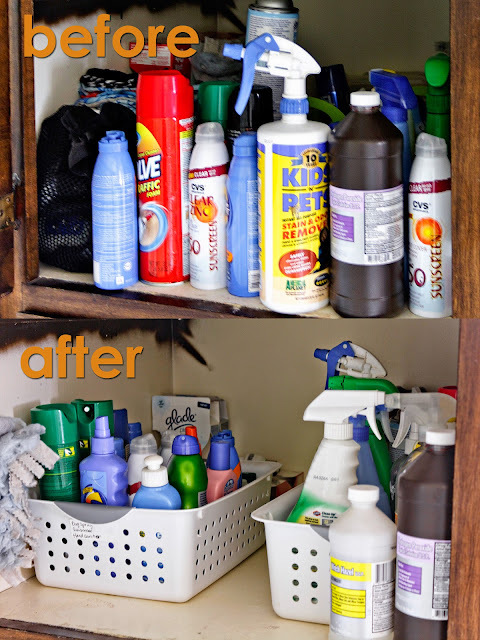 Then, in the other, I put all the cleaning supplies. Behind them, there are light bulbs (nicely packaged so they don't need their own containers). See the green bin in the above photo? It's from the dollar store. I bought a bunch of them a while ago. 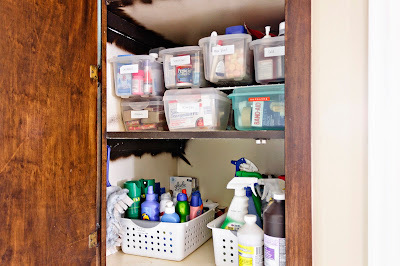 I have a post coming up how to organize on the cheap, and I have mixed feelings on the dollar store, but it works here. 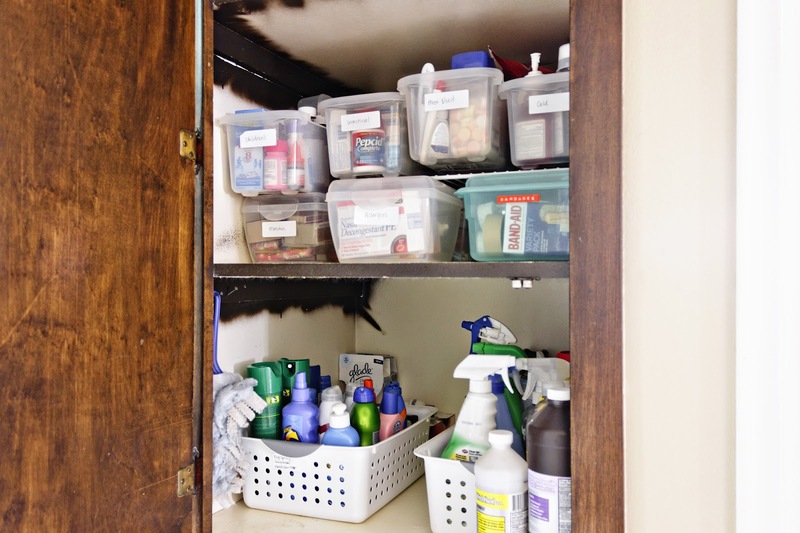 I have all my furniture polish/repair/leather conditioner in that bin, behind the cleaning supplies, because I don't use it much. I also stuck a few nails into the side to hang the duster. I would have preferred a cup hook, but I couldn't find a cup hook, and this is a zero dollar make over. 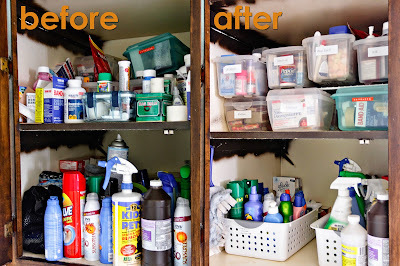 My process for the medicines was to clean up some of the existing organization. 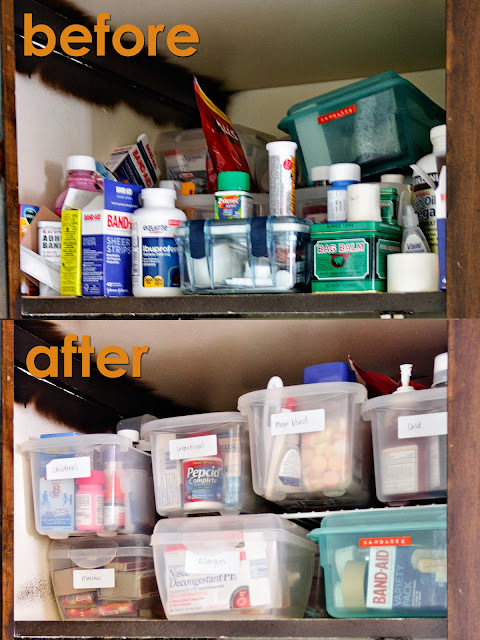 Around the edges, we had duplicate medications, so I rounded up all of those and put them in a bag (it's at the back of the cabinet). We'll check here first when we run out of anything. Then, I figured out what we were using most (it usually found its way to the front of the cabinet) and made a bin for our most-used medicines. It's also the easiest to reach and I made sure to put those thermometers in there. I am not losing those things again. I also combined a lot of packages of band-aids. We had a lot of band-aids. And I put all the athletic tape, band-aids and gauze together. That bin with some of the bandage stuff was actually hanging out underneath the bathroom sink. Doing no good whatsoever, because I don't think anyone knew it was there. The other categories are first-aid kit, allergies, cold/flu, digestion, pain relief, topical, and children's. The nail would definitely go to a cup cook. It's not dangerous or even ugly (you can't see it), but a couple of cup hooks would be so cute. 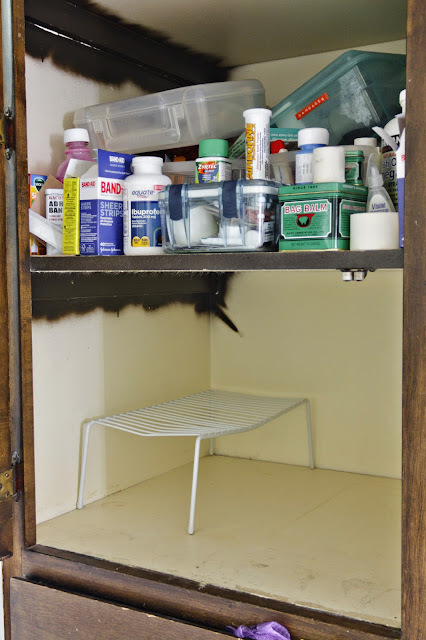 I would build a little wooden shelf of some sort to go across the medicine shelf in the front so that I could get rid of the metal one. The medicine bins don't quite fit. This is soooo annoying. I could maybe mess with it a bit more, but it's probably a bin problem. I would change them out. I would paint or something in there. Still might do this--it could be a super cute cabinet. Right now, it looks pretty sad. Wouldn't a stencil be darling?